A summons was issued by the St. Charles Police Department for a drug violation that occurred on Aug. 13 of last year. The summons was issued in the Scheidegger Center parking lot at 4:08 p.m, and the case was closed. A summons was issued by the St. Charles Police Department for a drug violation that occurred on Oct. 23 of last year. The summons was issued in the Scheidegger Center parking lot at 8:12 p.m, and the case was closed. A summons was issued by the St. Charles Police Department for a drug violation that occurred in the Pfremmer Hall parking lot at 11:17 p.m, and the case was closed. The St. Charles Police Department arrested a suspect in the Rauch Hall parking lot at 12:42 a.m. for a DUI and for leaving the scene of an accident. The incident occurred off campus on Boones Lick Road, according to Director of Public Safety & Security, John Bowman. Unknown people were causing a disturbance on Duchesne Drive while leaving a party at 11:40 p.m. The case was closed. An incident of leaving the scene of an accident that occurred in the Harmon Hall parking lot at 8:05 a.m. on Jan. 17 was reported to Public Safety & Security by a Campus Security Authority. A minor was caught in possession of alcohol on Lammert Court at 11:40 p.m. The case was closed and forwarded to the Office of Student Development for review. A two-door orange Honda Civic CI was stolen from a driveway on Glenco Drive at approximately 1 p.m. The case was closed, and the St. Charles Police Department is investigating. For more information, click here. A vehicle hit a water main cover in the roadway of the Ayres Hall parking lot and damaged their tire at 8:16 p.m. The case was closed. Jan. 23, 2016; 4:00 p.m. 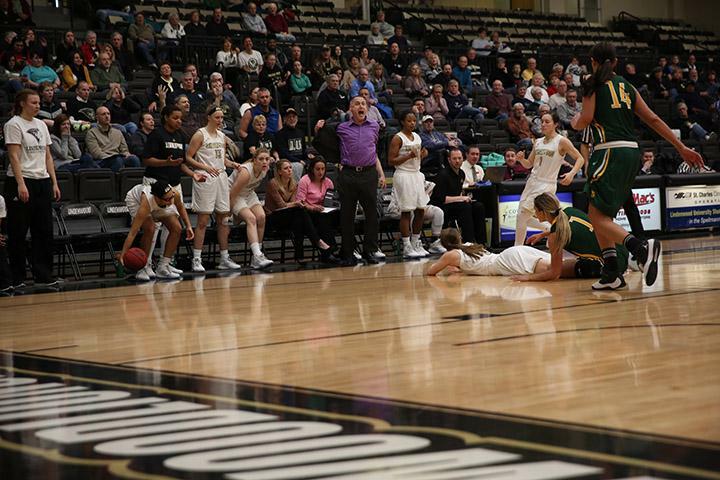 Despite mounting a double-digit second half comeback, the Lindenwood women’s basketball team once again fell in heartbreaking fashion, 71-68 at home to the Missouri Southern Lions.